This piece, on deepseanews.com, was written by an Oceanographer, and is a debunking of fears around the radiation risks. The bottom line is - Dilution means that by the time radioactive seawater makes it to the US West Coast, it'll be so far diluted to be barely an effect. It claims 538,100 terabecquerels (TBq) have been emitted from Fukushima, making it worse than Three-Mile-Island, and less than Chernobyl. The red shows areas where the radiation concentration is 10,000 times less than the concentration near Fukushima, and the band further out near the US West Coast is 1 million times less concentrated. It shows the Pacific Ocean concentration of Cs 137 in 1990 was 4 Bq / cubic meter. That makes the new concentration, thanks to Fukushima, about 10x the 1990 concentration. The amount measured in 1990 would have been leftover from the Atomic Bomb testing in the Pacific occurring during the 1950's. The writer of the piece concludes that it'll be safe to eat the fish and to swim in the ocean. As for leaking groundwater - 300 tonnes per day leaking into the ocean - is that a concern? It means the radiation won't be a one-time release, but is being released over time. However the bulk of the release occurred early on. Most of what's being released now is Tritium and Strontium. Strontium is a concern because it collects in bones, hence the risk is from eating fish that have bones in them. However, the Strontium risk is only for such fish caught near the Japanese coast. (Reuters) - Japan is considering more than $100 million in extra government spending to handle contaminated water at the crippled Fukushima nuclear plant, boosting the budget allocation by at least a fifth, government officials familiar with the matter said. The additional budget allocation of between 10 billion and 15 billion yen ($98 million-$147 million) aims to accelerate work on containing leaks and decontaminating the water, said the officials, who spoke on condition of anonymity. A newly released document from the Nuclear Regulatory Commission is a transcript dated March 16, 2011 concerning phone calls between US Officials who were dealing with the Fukushima crisis. I've uploaded a copy to my Google Drive account in case the original copy on the NRC website is mysteriously removed. My source of knowing about this comes from Michael Ruppert, in Facebook posts that I've embedded below. My reading of the transcript sounds like the speakers were in a state of confusion and dealing with conflicting evidence. However, it clearly says that at that moment they believed the spent fuel pools in reactors 2, 3 and 4 were completely emptied, and perhaps unit 1 as well, meaning that there was a complete release of all nuclear material from both spent fuel pools. In each case the spent fuel pools had a huge amount of highly toxic stuff in them. According to fukuleaks.org the transcript was one of a group of transcripts released by the NRC in February 2012. The transcripts document two things that this blog, and others, reported months ago. First, the spent fuel pool at Fukushima Reactor #4 was never empty of water. Second, remote sensing platforms, both aerial and in low earth orbit, were able to establish the status of the pool and that it had water in it. If the pool had been empty of water, the infra red heat signature of the pool would have been a white hot spot visible even in the surrounding wreckage caused by a hydrogen explosion. The Japanese government has declined to reveal their low earth orbit remote sensing data about Fukushima citing national security reasons. He went on to connect the transcripts with the 50 mile exclusion zone ordered for all American Citizens, prohibiting approach by Americans to the reactor site. With the documents it's clear the NRC made this order in reaction to reports that "the spent fuel pool at reactor #4 had lost all of its water and was spewing huge amounts of radiation as a result." It's that part of the transcript that Ruppert is focusing on. However, it's clear later in the transcripts, according to this report, that "NRC transcripts report that an unmanned aerial vehicle (UAV) flew over the reactor persuading NRC executive Chuck Casto, who was the NRC's man in Tokyo, that there was after all some water in the pool." A NY Times news report on the documents also focus on the confusion apparent in them. The issue of water in the spent fuel pond is important because "If the pool had been empty of water, the infra red heat signature of the pool would have been a white hot spot visible even in the surrounding wreckage caused by a hydrogen explosion." Further emptied fuel ponds would indicate the nuclear material had been released into the wild. That's ultimately what we're all concerned about - how much of the nuclear material has been released, and just how big is the problem we're all facing? Post by Michael C. Ruppert. Hanford, CT, USA - former Uranium/Plutonium factory for atomic bomb production --- etc ... with Chernobyl and Fukushima topping out the list at #2 and #1 respectively. The list of locations are on land and surrounding either the factories for producing atomic materials, the former nuclear bomb test sites, or sites of nuclear power plant accidents. This source made a somewhat more alarmist view on the list from brainz.org. However, this one includes a lot of useful links to resource sites. Radiation from the Fukushima power plant has been detected in Canada and Alaska. The report doesn't say how much radiation has arrived. It just gives a vague fear that we don't know what the effect on seafood and wildlife will be. Yes, we don't know that - but if we don't know the quantity of radiation how do we know whether this is a major thing, or a minor thing? The only statement of the severity is this - "The levels they are projecting in some of the models are in the ballpark of what they saw in the North Pacific in the 1960s," said Douglas Dasher, a researcher at the University of Alaska Fairbanks. The article does point out that there is no routine monitoring, so therefore it's not known whether radiation levels are increasing or decreasing. The statement, "North Pacific in the 1960's," refers to the fallout from US Nuclear testing on islands in the Pacific during the 1950's and 1960's. That testing was deemed necessary to fend off Communism. But it obviously left a fair bit of radioactive contamination in the Ocean. But that level of contamination doesn't seem to have been a serious problem. So if the radiation from Fukushima only gets to that level then the overall thing isn't a big deal? TEPCO is using a robot to traverse the Unit #1 reactor looking for leaks. It has found its first leak, close to the lower part of the Reactor 1 containment vessel at the wrecked Fukushima Daiichi on Wednesday. The camera spotted two leaks from the reactor into the containment building. Radiation levels near the leaks were measured at 0.9 to 1.8 sieverts an hour - whereas a typical release of radiation is generally accepted to be 1 millisievert a year. In other words the radiation level is off the charts compared to normal radiation releases. However that radiation release is occurring inside the containment building. However it's demonstrating that the containment vessel is cracked - which is to be expected. According to quotes from workers who had built the water storage tanks at the Fukushima plant - the storage tank construction was slipshod. They hired workers who weren't construction workers - they hired people like bus drivers. 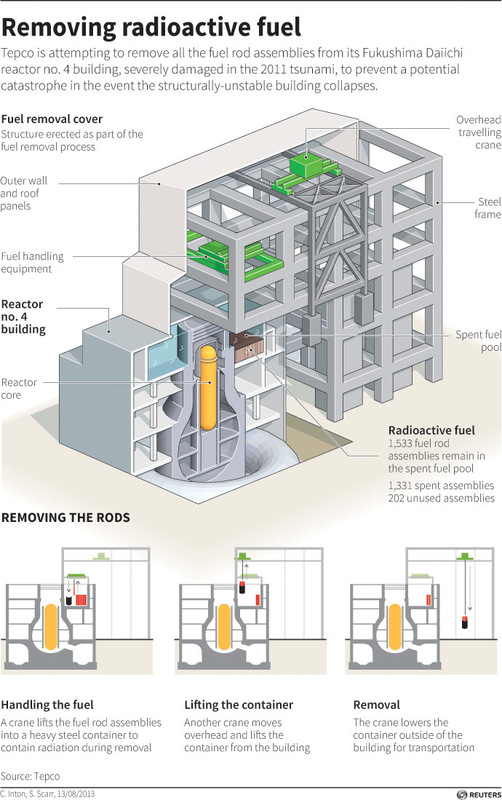 TEPCO's plan for moving fuel rods from unit #4 was approved during the week of November 7. The removal of fuel is part of regular work at any nuclear power plant, but "conditions are different from normal because of the disaster," said company spokeswoman Mayumi Yoshida. Extraction is expected to begin mid-November. The article contains some scary statements from Scientists and Activists. However some of these statements come from people who have a vested interest in making it look more scary than it actually is. While those statements could be valid, their vested interest has to make us ponder whether their statements are skewed or not. "This is the first practical milestone for the project," said Hiroshi Miyano, a nuclear systems expert and visiting professor at Hosei University in Tokyo. "Any trouble in this operation will considerably affect the timetable for the entire project," he said to AFP. "This is an operation TEPCO cannot afford to bungle." Christina Consolo, the founder and host of Nuked Radio ... “The worst-case scenario is that there’s a nuclear chain reaction, a criticality in the pool during this procedure and it can’t be stopped,” she said. Arnold Gunderson, a nuclear power expert, explained to RT that what they will attempt to do at Fukushima has never been done before but it has to be done ... “There is more radioactivity in that fuel pool than in all the bombs than in all the bombs that were fired in above ground testing. So we have the equivalent of 700 nuclear bombs worth of material in that fuel pool. These [the fuel rods] are not going to pull out easily and the fear is, is that they might snap and release the radiation that’s inside them,” he told RT. There's been reports that a large "island" of debris from the Fukushima Tsunami are floating in the Ocean and about to hit the US West Coast. The word "island" is a bit of a misnomer because it's just a large cluster of debris, rather than a solid mass. Cs-137 plume strongly diluted by July 2011, reaches American coast by 2014. Mode water formation and persistent upwelling affect Cs-137 concentrations. Cs-137 enters the deep ocean and exits the North Pacific in the next 30 years. Sensitivity to uncertainties in the source function and to interannual variability. 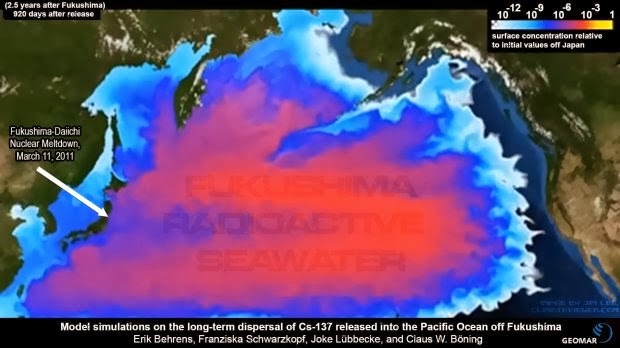 Following the March 2011 Fukushima disaster, large amounts of water contaminated with radionuclides, including Cesium-137, were released into the Pacific Ocean. With a half-life of 30.1 years, Cs-137 has the potential to travel large distances within the ocean. Using an ensemble of regional eddy-resolving simulations, this study investigates the long-term ventilation pathways of the leaked Cs-137 in the North Pacific Ocean. 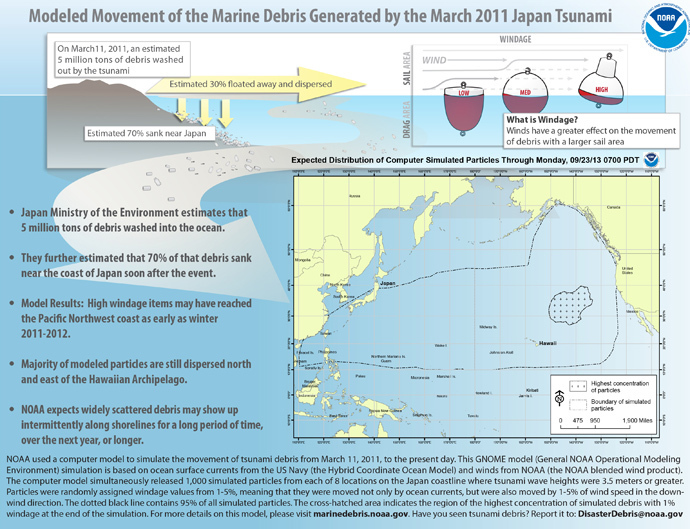 The simulations suggest that the contaminated plume would have been rapidly diluted below 10,000 Bq/m3 by the energetic Kuroshio Current and Kurushio Extension by July 2011. Based on our source function of 22 Bq/m3, which sits at the upper range of the published estimates, waters with Cs-137 concentrations >10 Bq/m3 are projected to reach the northwestern American coast and the Hawaiian archipelago by early 2014. Driven by quasi-zonal oceanic jets, shelf waters north of 45°N experience Cs-137 levels of 10–30 Bq/m3 between 2014 and 2020, while the Californian coast is projected to see lower concentrations (10–20 Bq/m3) slightly later (2016–2025). This late but prolonged exposure is related to subsurface pathways of mode waters, where Cs-137 is subducted toward the subtropics before being upwelled from deeper sources along the southern Californian coast. The model suggests that Fukushima-derived Cs-137 will penetrate the interior ocean and spread to other oceanic basins over the next two decades and beyond. The sensitivity of our results to uncertainties in the source function and to inter-annual to multi-decadal variability is discussed. “On Friday, I made my first visit to the Fukushima Daiichi Nuclear Power Station. It is stunning that one can see firsthand the destructive force of the tsunami even more than two and a half years after the tragic events. The words of President Obama following the incident still hold true today: ‘The Japanese people are not alone in this time of great trial and sorrow. Across the Pacific, they will find a hand of support extended from the United States as they get back on their feet.’ My colleagues from the Department of Energy and I are grateful for the cooperation and openness of our host, TEPCO President Hirose, and his dedicated staff. They face a daunting task in the cleanup and decommissioning of Fukushima Daiichi, one that will take decades and is being carried out under very challenging conditions. The TEPCO workforce is facing unprecedented challenges and is clearly focused on devising and implementing solutions. “From the beginning, the United States has worked to support the Government of Japan in the immediate response efforts and in recovery, decommissioning, and cleanup activities. Within days of the accident, the Department of Energy sent a team of 34 experts and more than 17,000 pounds of equipment in support of efforts to manage the crisis. I was able to witness firsthand the continuing partnership between TEPCO and U.S. agencies and companies. “The DOE, our national labs, and U.S. companies will continue to offer our experience and capabilities to assist the Japanese government and TEPCO, especially with regard to water contamination issues. On Thursday, we were able to meet with Prime Minister Abe, METI Minister Motegi, and other senior members of the Japanese government. Their commitment to advancing the Convention on Supplementing Compensation of Nuclear Liability is much appreciated, since this will facilitate the further engagement of U.S. and other companies in Fukushima cleanup. “We also witnessed the progress being made on spent fuel removal activities in parallel with the water challenges. It appears that spent nuclear fuel will begin to be removed from Unit 4 as scheduled in mid-November. This will be significant milestone for TEPCO and the Japanese Government and in the process of decommissioning the site.